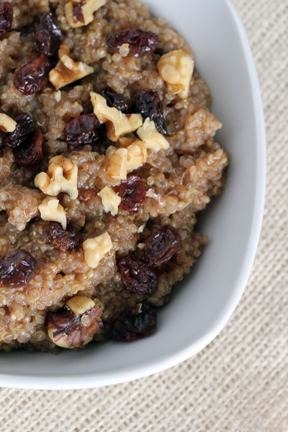 Goldilocks is sure to eat all three bowls of this delicious “dressed up oatmeal”! This gluten-free breakfast is sure to please the entire family, not just those who need to eat sans gluten. 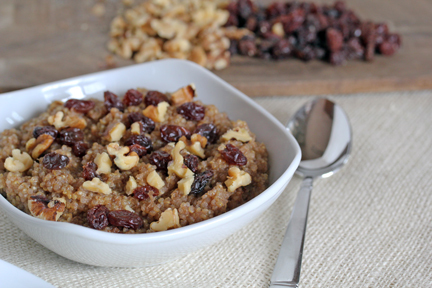 It’s cooked quinoa with a little sweetness and cinnamon, then topped with walnuts and raisins. Move on over Wheaties…this is the new breakfast of champions! Protein from the quinoa and the nuts, small dose of fruit from the raisins, and a little bit of antioxidant from the cinnamon! Serve with with some milk, or as is. Serve it with some fresh fruit, or as is. In a medium saucepan, bring 4 cups of water to a boil. Add the quinoa with a pinch of salt. Once it returns to a boil, reduce the heat, cover and cook for about 15 minutes. As the quinoa nears the end of its cooking time, stir in the sweetener and the cinnamon. Remove from heat once it has finished cooking. Sprinkle the chopped walnuts and raisins/cranberries over the top. Serve warm with or without milk, cream or yogurt. Yum! I’ll have to try this next week for an extra boost of protein for breakfast! What is quinoa? And where do you find it in the grocery store? It’s an “ancient grain.” My store sells it in the “natural and organic section,” or it can be found on Amazon. You’ll also find it at club store’s like Costco. I love quinoa for breakfast. I start the day energized and stay full for hours. I usually find quinoa in the rice aisle of my grocer, but I have also found it in the special diets aisle, baking aisle, or cereal aisle (in the Bob’s Red Mill display). Whole Foods sells quinoa in bulk bins. I go there to stock up on red quinoa. I have been looking for some healthier alternatives for breakfast! I checked my store to see how quinoa was and thought it was pretty expensive but I will check again as I really want to try it as it is so healthy. This recipe looks so good and if I do buy quinoa this will be the first recipe I make with it. You might find it for less on Amazon or in a warehouse club or health food stores Lisa! It’s certainly one of those ingredients you want to price out and find the lowest option! I think I’ve seen it in the bulk bins at whole foods. You might try Trader Joe’s too. Thanks for the tip, Erin. I checked again this morning at my local grocery store and I was right-for a small bag of quinoa it is $11.98. A bit too expensive right now but maybe someday when I don’t have to buy much some week I will pick up a bag. I have heard so much about and been wanting to try it. I will check Amazon also! Costco sells it for a reasonable price for a large bag of it. Plus a little goes a long way, when cooked, it doubles the amount like rice does, so if you cook 2 cups you end up with 4 cups. It also freezes well so if you cook more than you need just freeze in a freezer bag until needed. Great post and photos. You are right: quinoa is delicious and a great alternative to other hot and cold cereals. Thank you for sharing. I definitely want to try this, although I’m going to explore whether I can fix it in my slow cooker, because I NEVER seem to get rice or grains right when I try them on the stovetop. I honestly didn’t think quinoa was all that expensive. Whole Foods sells it in the bulk aisle so you can buy just as much as you want, or buy a box. Tried it this morning! We liked it, but I need a little more flavor for my taste so we added some organic applesauce. I really liked it like that! We also didn’t have any walnuts, so we added sliced almonds. Thanks for the recipe! I have cooked quinoa for awhile, but I never thought to cook it for breakfast! I got a large bag of organic quinoa for less than $10 at Costco. Hi. This sounds so good. I never thought of using quinoa in this way. Definitely going to give it a try. Just one question, can agave syrup be substituted for the brown sugar? and do I use 1/4 cup or less. Can you cook it for 1 person and refrigate the rest for the next day? Yes Jackie…I have a post about that very thing coming soon! You can cook a big batch and then portion out single serve portions into smaller plastic containers and store in the fridge for up to 5 days. Mix in what you like to the plain quinoa every morning for a quick, nutritious breakfast!